You have to respect DOOM, OK? You just have to. I only needed a few listens of his latest album Born Like This to realize the man was doing something different. Something interesting. Something worthwhile. Working my way through his catalog, I spent my sweet time with Mm..Food and I can honestly say it was time well spent. After having properly digested the album, you’ve got to give it to the man for his conceptual approach to album making. A quick browse through his Wikipedia page is all it takes to get you caught down the rabbit hole of conspiracies, controversies and complexities surrounding DOOM’s career. And while most mainstream rappers are concerned with bravado and flashy nonsense, DOOM has instead given us an album about… food. The concept is so alien that you need to take your time with this this to truly let it sink. An aspect of Mm..Food that makes it so interesting is its attention to detail. Just the name itself is an anagram for M.F. Doom. 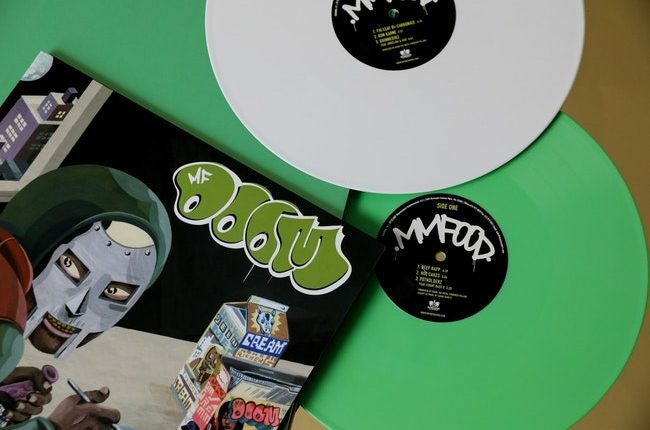 But this album also is trying to tell a story, one involving the character of Doom, his origin story, his quest for dominance and his appetite for food. So over the top, Mm..Food also knows not to take itself too seriously and its tracks are as cool as they are quirky. DOOM certainly knows how to inject his sense of humor into his songs. We’ve been highlighting Vinyl Me Please throughout the year and this time they truly broke the mold. Their catalog is all over the place, sure, but they truly broke the mold with this one. DOOM must be heard and studied and no serious record collector would miss this album in their collection. Vinyl Me Please has not only reissued this precious album on wax but has also gone and re-released the even rarer Born Like This (to be featured later on this column…hopefully). To say we are impressed with its curation is to put it very mildly, and once again, it highlights the importance of a Vinyl Me Please membership. Like everything else DOOM seems to do, Mm..Food is ahead of its time. We recognize DOOM’s work as being significant but its only after time passes that we truly understand its impact and just how deliciously fresh it still sounds.